The real anthotype season is in full swing and I conflicted by competing projects including the show in Japan this September. I’ve been collecting sleepwear which I’ll discuss in the next few days. 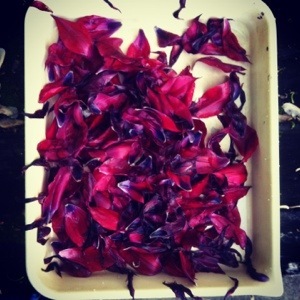 I’ve been gleaning red tulips petals from the University of Dayton campus and combining them with some purple tulip petals frozen since St. Valentines day. 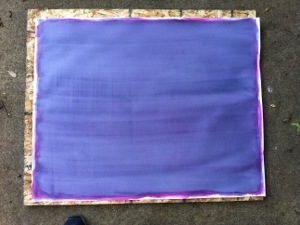 I had coated a few sheets of Fabriano with canned beet juice and decided to layer the tulip mix on top. While it was wet it seemed to increase the pigment density but after two coats of tulip on top of the beet emulsion, things went awry. It got lighter. My wife, the painter that she is, suggested putting more canned beet juice on top. My initial feeling is that it is improving but I’ll look at it tomorrow in the daylight. This entry was posted in Anthotypes and tagged anthotype, beet root, sleepwear, somnambulist, tulip by Francis Schanberger. Bookmark the permalink. Hey Francis. You’re doing a September show in Japan? That’s where I am! We should meet up to chew the fat and talk the juice. Lemme know. With my teaching schedule I probably won’t be able to go to Japan for the opening. The exhibition will be at the Japanese Paper Museum in Ino Town, Kochi Prefecture.